I spent pretty much the whole day watching this guy cook on YouTube. 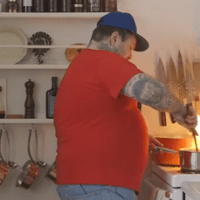 Matty Matheson, Canadian actor, producer, cook, and everyman, has this acute sense of humor that just makes me smile. With a big ol’ smile and a few foul words, he is like an punk rock chef for the modern twenty something. I have to say, his preparation and presentation are so well put together I think even I could make some of these more difficult recipes. Again, he uses some bad words and makes a few adult jokes, but the food is good and I just had to share.